Mature Size: 3' high and 1.5' wide. Flowers: Five bright yellow rays, with a yellow to orange center, lacking fragrance, edible. Bloom: Late summer and fall with regular water and full sun. Removing spent flowers lengthens its bloom time. Leaves: Green, long and narrow, having a licorice scent, edible, with a tarragon-licorice flavor. Roots: After four months of growth, secretions from the roots may have insecticidal properties in the soil against nematodes and may also hinder the growth of some species of nearby plants. Wildlife: Attracts bees, butterflies, and pollinating insects. Not browsed by mammals. Known to repel some insect pests. Origin: Mexico to Central America. USDA hardiness zones: 8-11. It dies to the ground and regrows from its roots in spring in regions with freezing temperatures. Sun: Full sun to light shade. Water after becoming established: Monthly to weekly depending on temperature and appearance. This plant can survive on low water but needs regular water to bloom. Soil: Well drained, moderate organic content, tolerant of soil types, pH 6.1-7.8 (slightly acidic to slightly alkaline). Mulch: Just before the first frost of the winter season to protect roots from freezing. First Year Care: Place seedlings outside after the last expected frost. By fall it should be root hardy enough to over-winter. Planting: It can be grown in a container. Prune: In mid-summer, trim to shape and reduce size if desired. Removing spent flowers quickly extends the blooming season. Litter: Low except that it dies to the ground in freezes. Uses: Ornamental, culinary. The strong-flavored leaves are used raw in salads, as a tarragon substitute in cooking, and was used by the Aztecs to flavor a chocolate drink. An anise-flavored tea, made from the leaves and flowering tops, is very popular in Latin America. The flowers can be used fresh to color salads. The whole dried plant can be dried, ground to powder, and burnt as incense to repel insects. This plant is a member of the Aster family (Compositae). 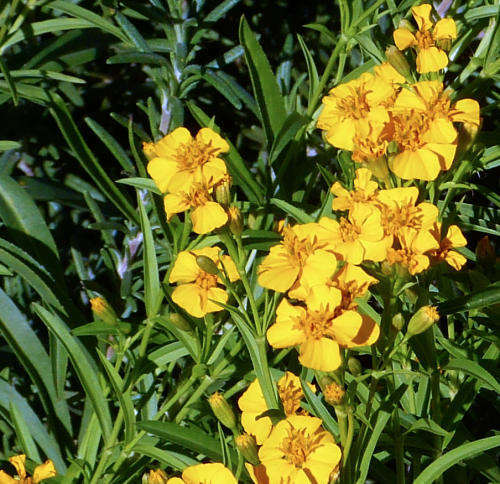 It has many common names, including Mexican Marigold, Mexican Mint Marigold and Spanish Tarragon.